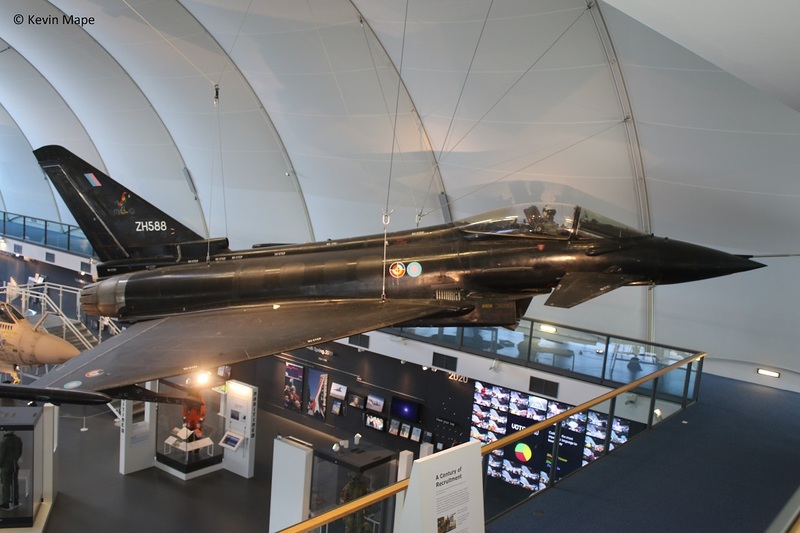 DA2/ – f/f 06/04/1994 – ZH588 :Bae Test Fleet – Eurofighter 2000 – All black. last flight 29/01/2007 BAe Warton to RAF Coningsby – Preserved RAF Museum, Hendon. last flight 13/12/2006 – BAe Warton to RAF Coningsby – Preserved IWM Duxford – 22/04/2009. Tranche 1 Block 1 – All upgraded to Block 5 Standard. PT001/IPA1 / Build No. 1001 – f/f 15/4/02 – ZJ699 : Bae Test Fleet – Eurofighter 2000(T) /Unmarked / Bae test fleet. Reduced to spares – Fuselage to BAe Training Collage at Humberside Airport for Inst use. Tranche 1 Block 1B – All upgraded to Block 5 Standard. 6/ ex 809 code only. Tranche 1 Block 2 – All upgraded to Block 5 Standard. 12/914 code only (29 Sqn). BS09/ Build No.1062- f/f 15/12/05 – ZJ918/Unmarked/Typhoon FGR4– Stored at Shawbury. 5/919/6Sqn – MacRoberts Reply special badge below cockpit. WFU – To Warton for Saudi Training school by Road from Coningsby..
5/ ex 923 code only. BS16 / Build No.1080 – f/f 11/4/06 – ZJ925/DXI/XI(F)Sqn /Typhoon FGR4 – – Stored at Shawbury. BT13/ Build No.1085 – f/f 22/8/05 – ZJ812/812/29(R)Sqn/Typhoon T3 – RTP Coningsby 11/18. BS18 / Build No.1089 – f/f 15/6/06 – ZJ927/927 code only/Typhoon FGR4 – Stored at RAF Shawbury. BT14 / Build No.1091 – f/f 4/11/04 – ZJ813/BL/29(R)Sqn/Typhoon T3 . BS21 / Build No.1099 – f/f 1/8/06 – ZJ930/930 code only/Typhoon FGR4- Stored at Shawbury. BS22 / Build No.1103 – f/f 14/2/03 – ZJ931/ 931 code only /Typhoon FGR4 f/n 11/7/17. BS23 / Build No.1105 – f/f 14/2/03 – ZJ932/DB/XI(F)Sqn/Typhoon FGR4 Stored at Shawbury. BS25 / Build no.1111 – f/f 12/10/06 – ZJ934/934 code only /Typhoon FGR4 – Stored at Shawbury. 1/ex Unmarked – This Typhoon has never flown in RAF service. Reduced to Fuselage only at Coningsby – Moved to Shawbury store 29/7/15. BS037 / Build No. 1149 – f/f 20/1/2009 – ZJ944/Unmarked/Typhoon FGR4 – Stored Cat 3 after taking the RHAG (9/6/16) at Coningsby. This Typhoon has never flown in RAF service. The missing BS & BT numbers were Typhoon aircraft diverted to the Saudi Arabian order. BS052 / Build No.1200 – f/f 7/7/09 – ZK300/300 code only/Typhoon FGR4. 6/ex H in Triangle only. 6/ex TP-V/29(R)Sqn special D-day marks. – Invasion stripes. Build No.1258/BS63 f/f – 2/9/2010 – ZK310/310 Code only/Typhoon FGR4. 4/ ex FA/1(F)Sqn Has Hornet motif on one side. ZK326/FB/1(F)Sqn/Typhoon FGR4 – Stored at Coningsby. 3/ex FC/1(F)Sqn- Hornet motif on each side of the nose. Build No.1367/BS100/f/f -1/6/12- ZK339/339 code only /Typhoon FGR4. 3/ex ED/6Sqn 100 year marks. 3/ex FN/1(F)Sqn- Hornet motif on each side of the nose. Build No.1402/BS111 f/f – 08/7/13 – ZK350/ Unmarked/Typhoon FGR4 – Still at Warton. 5/ex 354 code only . 1/ Unmarked – flew with 29 & XI(F)Sqn unmarked. 1/ Unmarked / BAe Test Fleet. Build No.1471/BS131 f/f 7/8/15 d/d – ZK370/Unmarked/Typhoon FGR4 – Still at Warton. 1 / Unmarked. – To Lossiemouth 1/12/17. 3/(1(F)Sqn)/372 code only f/n 9/8/17. 2/29(R)Sqn/ BB code only. f/n 14/11/16. 1/Allocated to 29(R)Sqn/Unmarked f/f 4/11/16. 2/ – 427 code only (29(R)Sqn). Build No.15**/BS150 f/f 6/8/18 d/d 19/10/18 – ZK434/Unmarked/Typhoon FGR4. Build No.15**/BS151 f/f 4/9/18 d/d 21/11/18 – ZK435/435 code only/Typhoon FGR4. Build No.15**/BS152 f/f 15/10/18 d/d 12/12/18 – ZK436/Unmarked/Typhoon FGR4. Build No.15**/BS153 f/f – ZK437/Unmarked/Typhoon FGR4. Build No.15**/BS154 f/f – ZK438/Unmarked/Typhoon FGR4. Build No.15**/BS155 f/f ******* – ZK439/Unmarked/Typhoon FGR4. The end of the RAF order for Typhoon.